A team of engineers led by Matt Keennon at California-based aerovironment developed the Nano hummingbird for the Defense Advanced Research Projects Agency. The Nano hummingbird is composed of four components; low-res camera, 6.5 inch wings, transmission and plastic shell. It is designed to mimic the flight of a hummingbird. It can fly up to 17.7 km/h in all direction. It is capable of hovering and rotating clockwise and counterclockwise. 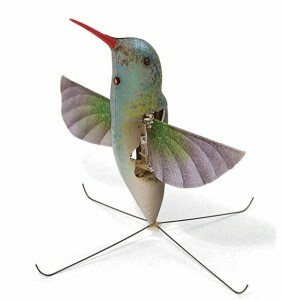 This remote controlled aircraft weights about 18.7 g or less, heaver than the average hummingbird. Because the Nano humming bird is so small and equipped with a camera it is an ideal surveillance drone. Capable of identifying targets, collecting Intel and locating hostages. It is urban friendly so it can be used on and off the battlefield. The pilot of this aircraft simply flies it using only the image streamed from the video camera. The most important factor of the Nano Hummingbird would be its 6.5-inch wings. Its wings went through 300 designs before it was finalized. Unlike most flying robots, it does not use rotors or propellers, so it can maneuver in tight spots. The hummingbird is capable of hovering due to its unique stroke. When it hovers, the strokes of its wings create a figure-eight stroke lying in the horizontal plane. Unlike other birds, the hummingbird creates lift on its down stroke and upstroke. On its upstroke, it twists its wings backward. This creates an angle of attack sustainable of generating lift. Just like the hummingbird, the Nano hummingbird navigates by changing the angle and shape of its paper-thin wings, beating between 20 to 40 times per second. It is capable of hovering in place for 11 minutes; it can even hover in gusts of wind.